When a child is born with an abnormal formation of the head, face, or neck region, otherwise referred to as a craniofacial anomaly, it is naturally distressing to you. These anomalies can include ear deformities, cleft lip and palate, Pierre Robin Sequence, hemangioma and vascular malformations, skull deformities and tumors, as well as other disorders. At the Pediatric Plastic and Craniofacial Program (“FACES”) we offer a comprehensive program for the complete care of your newborn, infant, or child. Our FACES North Florida multidisciplinary team includes our pediatric craniofacial head and neck surgeon, pediatric plastic surgeon, pediatric oculoplastic surgeon and our pediatric oral maxillofacial surgeon. Our multidisciplinary team cares for the most complex of disorders to ensure the highest quality of care for your newborn, infant, or child. FACES North Florida has the most comprehensive and innovative ear deformity program in the region. Our pediatric plastic surgeon was the first in the region to introduce EARWELL™, or newborn ear molding to the region (this newborn ear molding procedure corrects ear deformities without invasive surgery in the first few weeks following delivery). Our approach utilizes both surgical and nonsurgical options for the correction of your newborn, infant or child’s ear deformity. 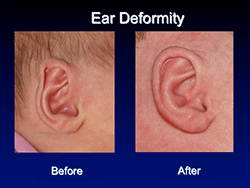 Ear deformities can include a lop ear, cup ear, Spock ear, protruding ear, constricted ear, and several other ear deformities. In the event that your child requires surgery for his/her ear deformity, you can be reassured that our surgeons utilize the most current and innovative techniques to care for your child. Cleft lip, in the past referred to as a harelip, and/or palate, are deformities caused by abnormal facial development during gestation. A “cleft” is an opening or a gap. Approximately 1 in 700 children born have a cleft lip or palate or both. 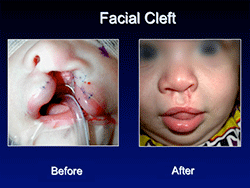 Clefts can also affect other parts of the face including eyes, ears, nose cheeks and forehead. A cleft lip or palate can be successfully treated with surgery and specialty intervention soon after birth or in early childhood to ensure adequate feeding and nutrition, speech development, and aesthetic facial appearance. FACES offers comprehensive care including a multidisciplinary team consisting of a Pediatric ENT Surgeon, Pediatric Plastic and Craniofacial Surgeon, Pediatric Oral-Maxillofacial surgeon, speech language pathologist and audiologist to provide complete care for your child. 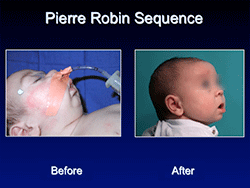 Pierre Robin sequence is a condition present at birth in which the newborn has a smaller-than-normal lower jaw causing the tongue to fall back in the throat. This impacts your newborn’s breathing and swallowing and can lead to airway and sometimes feeding difficulties. Treatment involves a state-of-the-art procedure that “distracts” or extends the newborn jaw in a short period of time. This allows new bone to grow and expands the airway which eliminates the need for a breathing tube or feeding tube. Our FACES pediatric craniofacial surgeon, Dr. Saswata Roy, developed and introduced the first and only neonatal distraction program in the region to treat this condition. Dr. Roy has performed numerous neonatal distractions and is known both regionally and nationally for his work treating this condition. A hemangioma is a type of birthmark caused by a cluster of blood vessels that do not form normally. This condition develops shortly after birth. A hemangioma is usually found on the newborn’s head or neck and it can be close to the surface of the skin or below the skin. A hemangioma that is close to the surface of the skin appears as a red strawberry-like or purple bump on the skin and may continue to grow and spread. While a hemangioma that is deeper under the skin will appear as bluish swelling under the skin. Hemangiomas can lead to ulcers or deep sores in the skin, scarring and disfigurement. More serious hemangiomas can interfere with the growth and function of structures nearby such as eyes or airway. A hemangioma is one of the many types of vascular malformations. 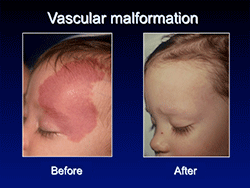 Vascular malformations grow steadily throughout the growth of the child. Without treatment, a vascular malformation will not diminish or disappear. Treatments of vascular malformations include appropriate medical management laser therapy for superficial lesions, and surgical removal for deeper lesions. The management of vascular malformations and hemangiomas is complex and often requires evaluation and treatment by a multidisciplinary team. At FACES, we offer the latest, most innovative treatment to deal with your child’s hemangioma or vascular malformation. 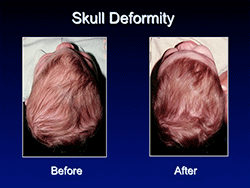 The two most common types of skull deformities are craniosynostosis and deformational plagiocephaly. The skull is composed of bones which are separated by sutures. Craniosynostosis refers to the early closing of one or more of the sutures of the infant’s skull before the brain has stopped growing. There are two courses of treatment for craniosynostosis: Open versus endoscopic repair of the skull. FACES craniofacial surgeon, Dr. Saswata Roy, utilizes an innovative minimally invasive technique referred to as endoscopic repair. Endoscopic repair creates small incisions to allow room for the brain to grow and shape the growth of the head. This procedure results in reduced scarring and faster recovery for your newborn or infant. Dr. Roy, developed and introduced the first endoscopic craniosynostosis repair in the region. means head. A literal translation of deformational plagiocephaly is an “oblique head.” Deformational plagiocephaly arises when constant pressure is applied to the same spot in an infant’s skull. The bones in an infant’s skull are very soft and easily misshapen. This condition can often improve or resolve with conservative management and repositioning techniques. However, when there is little or no improvement with this condition, FACES surgeons utilize Orthomerica’s state of the art STAR scanner, to obtain precise measurements in 1.5 seconds and capture 3D data. Using STAR scanner’s quick, accurate measurements, a custom head band or star band can be made and worn to improve the shape of the head. In the past, a child who had a skull or orbital tumor underwent an invasive procedure requiring a facial incision which often resulted in visible scarring. Now, our FACES surgeons utilize an endoscopic technique which is a minimally invasive way to remove a tumor without a facial incision. This procedure results in little to no scarring and a quicker recovery. 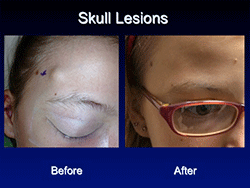 If your child has a skull or orbital tumor, contact FACES to schedule an evaluation with one of our surgeons. If your child suffers from a pediatric plastic, reconstructive or craniomaxillofacial condition effecting the structures of head, face, eyes or neck please contact us to schedule an appointment.